Whale Quest Kapalua is a collaboration with Whale Trust, involving marine education in addition to the visceral thrill of seeing humpbacks in their element. Hollywood couldn't have come up with a more enthralling script for the debut of Whale Quest Kapalua on Maui last year. The drama began on Feb. 9, the day before the start of the three-day event, which educates the public about the humpbacks through seminars, exhibits and whale-watching trips. Notes: A few packages are available during Whale Quest Kapalua. Feb.15 to 18 rates at Kapalua Villas (800-545-0018) begin at $231.20 per night for a one-bedroom Fairway View villa, based on a four-night minimum stay. The Ritz-Carlton, Kapalua (800-262-8440) is offering an Explore Maui Car Package starting at $460 per night for a garden-view room, with compact rental car and daily buffet breakfast for two. Rates for the hotel's Bed & Breakfast Package begin at $445 per night for a garden-view room, daily buffet breakfast for two and overnight valet parking. Both packages are available Feb. 12 through April 8 and there's no minimum stay requirement. A 40-ton, 45-foot male humpback was seen off the Big Island with heavy-gauge lines caught in its mouth and wrapped around its body and tail. Two buoys were attached to the lines, creating a deadly situation. After the first responders fastened a tracking device on the entangled gear, the humpback disappeared in rough seas. Two days later, David Mattila, science and rescue coordinator for the Hawaiian Islands Humpback Whale National Marine Sanctuary, discussed the encounter during his talk at Whale Quest Kapalua. The next morning, a few people who attended his presentation spotted the entangled humpback during a whale-watching tour between Maui and Lanai. Mattila and Ed Lyman, marine mammal response manager for HIHWNMS, were called to the scene. As they bobbed in a small rubber inflatable, the two men attached additional buoys on the lines trailing from the whale to slow its pace and to keep it at the surface. They used hooked knives fastened to the ends of long poles to sever the lines, a dangerous task that should be attempted only by those like them who have received authorization from the Marine Mammal Health and Stranding Response program administered by the National Marine Fisheries Service. Two hours later, Mattila and Lyman freed the humpback from the thick lines. "He immediately took off and joined a group of other males that were chasing a female," said Lyman. "That was a great sign. He had been dragging the gear for a long time, and it was like he was saying, 'Hey, I'm back! I got that stuff off me!' If he felt good enough to join the guys again, he probably was going to be just fine." Numbers on the two buoys originally attached to the whale were later traced to king crab gear set off Kodiak. "When you see mouth entanglements, you think the animal may have picked them up in Alaska, where the whales feed before coming to Hawaii," said Lyman. "That humpback had swum at least 2,500 miles from Alaska to Hawaii with lines and buoys attached to it!" 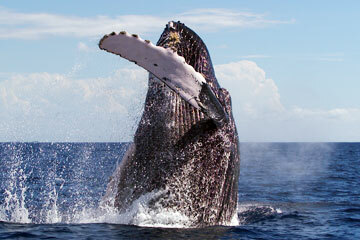 Whale-watching tours are a main attraction of Whale Quest Kapalua. IN ADDITION TO helping distressed marine animals, Lyman participates in continuing outreach programs. "Whale Quest Kapalua is a great opportunity for those of us in the research community to share what we've experienced and learned about these amazing animals," he said. "The more people we can educate at such events, the better the chance marine conservation efforts are going to be successful." 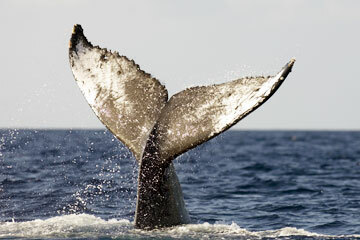 To launch Whale Quest, Kapalua Resort collaborated with Whale Trust, a nonprofit organization that was founded on Maui in 2001 to "promote, support and conduct scientific research on whales and the marine environment, and develop public education programs based directly on results of scientific research." According to Nancy Cross, Kapalua's vice president/events management, the humpbacks are a big draw for many people who vacation on Maui during whale season from mid-December through May. "They spend much of their visit watching whales from lookout points, taking whale-watching trips and buying artwork and books on whales," said Cross. "That's a much-anticipated part of their experience here, and Whale Quest Kapalua enriches that experience by giving them an opportunity to meet and mingle with professionals who are studying and documenting the humpbacks on film and in books, magazines and newspapers." Some 2,000 people are expected to attend this year's event, which features 14 seminars by 16 researchers, writers, photographers and cinematographers from Maui, Oahu, Japan, Germany and the mainland United States. Included in this distinguished group are Steve Gittings, Ph.D., science program manager for the National Marine Sanctuary Program of the National Oceanic & Atmospheric Administration; Douglas Chadwick, a wildlife biologist and the author of seven natural-history books; Chris Johns, editor in chief of National Geographic; Mark Ferrari, co-founder of the Center for Whale Studies; Koji Nakamura, president of Japan Underwater Films Co.; and Flip Nicklin, a world-renowned underwater photographer. "We are delighted to welcome these experts to Kapalua to help Whale Quest Kapalua deliver its important conservation message," said Cross. "Besides being magnificent creatures, humpbacks have much to teach us about the laws that govern nature and how life below the sea can dramatically affect life above it." Some of Whale Quest Kapalua's offerings this year are outlined below. Check out the Web site for a complete schedule. » Whale-watching tours: Depart all three days at 7 a.m. from Lahaina Harbor, with narration by a whale expert. Cost is $35 per person and proceeds benefit Whale Trust, the Center for Whale Studies and the Hawaii Whale Research Foundation. Reserve at (808)-669-2440. » Friday: Golf enthusiasts will tee off in a charity tournament for the same nonprofit research organizations at Kapalua's Plantation Course. The $400 entry fee includes an awards lunch. Hole sponsorships cost $2,000 and include entry fees and lunch for one team of four players. » Saturday and Sunday: View displays and chat with representatives from a dozen research, conservation and environmental organizations. » "Encounter with the Western Pacific Gray Whale": This documentary chronicles a researcher's dive with a gray whale 60 miles north of Tokyo. » "Whales in Mind": A filmmaker takes you on a journey that features high-definition photos and footage of whales never shown to the public. >> "Whale of a Tale: The History of Whales and Whaling in Lahaina": Get a glimpse of the impact of whales and whaling on Lahaina, the first capital of the Hawaiian kingdom. » "Humpback Whales in Hawaii: What Researchers Have Learned (And A Few Things They Have Not Learned)": A survey of research over the past 30 years. » "Humpback Whales in Hawaii: Hawaiian By Birth, Alaskan by Blubber": Before migrating to the islands in the winter, humpback whales feed in Alaskan waters. This seminar examines their dual residences and why the perpetuation of the species is closely linked to a healthy Alaskan marine ecosystem. » "Humpback Story from National Geographic": Find out what it took to produce the words and images for a recent National Geographic story on humpbacks. » "Humpback Whale Survival: Understanding Disentanglement Efforts and World Research Projects": Learn about two of the world's largest humpback whale research projects and Hawaii's community-based disentanglement network. » "A Whale's Eye View: Insights Into Humpback Whale Mating Habits Using Crittercam": Rare underwater footage shows the whale's mating habits and social interactions. » "Man, Kayak and the Whale": One Maui resident has spent more than 30 years kayaking Hawaiian waters alongside the humpbacks.